Auditions are an exciting and sometimes nerve-wracking time! Check out our favourite tips below to help you ace your next audition with confidence. Do you have your own favourite tips to share? Comment or email dance@waps.com.au! Be a team player and be nice to everyone. Auditions are a really great way to meet other people and make new connections within the industry. If you are rude, come across as someone who is difficult to work with, or have a big ego, it is highly unlikely you will get booked or asked to audition for other roles. Ensure that you are always polite and friendly! Know your role. Make sure you know the ins and outs of the role you are applying for. Try and read as much of the script beforehand to make a connection with the character. I.e. What does your character think about themselves? What do other characters think and say about your character? The more you know about the story and the character, the more you will be able to do with the script! Show personality. Let your own personality traits and sense of humour shine through during your audition! Ask questions if you are curious, and try to avoid one-word answers. Let the judges get to know a bit about you, and it may be your charming personality that books you the job! Audition over and over again. The best way to get better at something is to practice it, and auditioning is no exception to the rule. Its a great way to develop your self confidence, get used to the audition nerves and build experience with the processes of auditions. You’ll be an expert in no time! Be confident. It may sound easy, but its actually one of the trickiest skills to master! You are being judged as soon as you walk into the room, so make sure keep your head held high and practice confident body language and posture. Actors need to be able to command the attention of everyone in the room. Try not to fiddle, shuffle your feet, or look nervous… And don’t forget to smile – thats the lasting impression you want to leave everyone with! Take regular classes. A good actor or actress will always take classes to further develop their training! Learning new skills, techniques, and pieces to add to your repertoire in classes will make you a stronger performer and a better candidate in auditions. 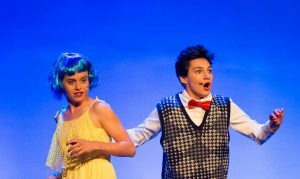 At The WA Performance School we offer Drama and Acting classes to students who are wishing to get started in the amazing world of acting, and those who are looking to improve on their skills. We also offer acting in conjunction with other styles, such as our Singing and Drama classes, and our Musical Theatre classes. Contact us today for more information on how to get your acting career started!